Our second day began with a private city tour of Agadir by taxi. 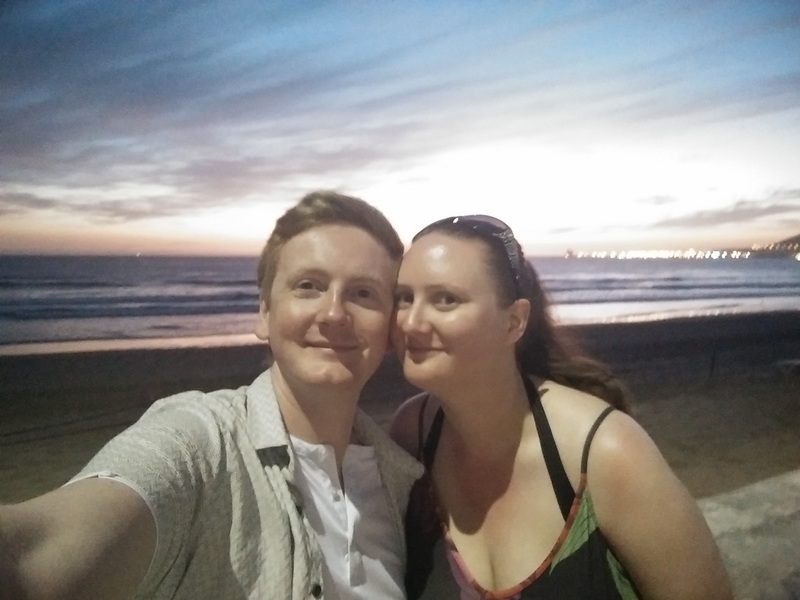 Whilst it was a nice afternoon, it did highlight to us that there isn’t really that much to do in Agadir. We were driven down to the Marina, where it would cost you up to £500,000 to purchase an apartment, it’s home to some of Morocco’s finest. We then travelled to the fishing port, where we saw the fisherman coming in with fresh sardines, and across the road where new boats are being built right next to the water. 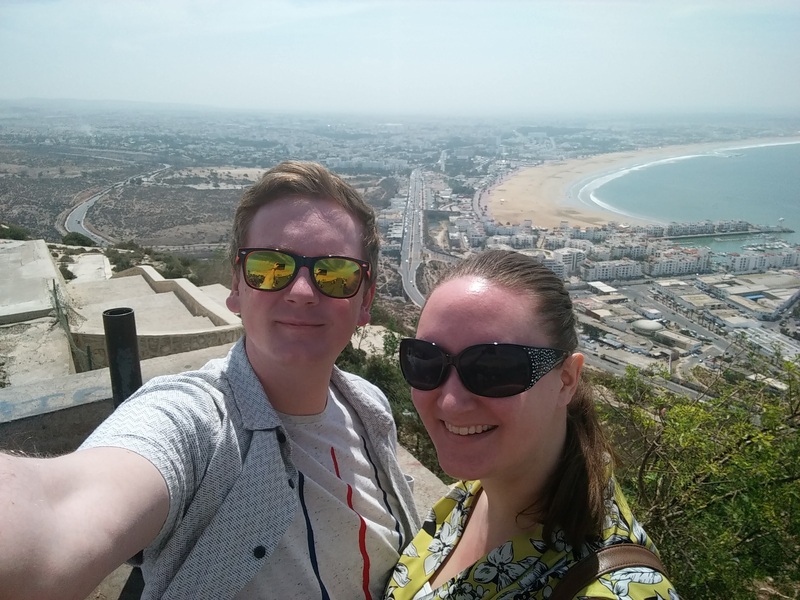 We then headed up the hill to the kasbah, situated on the top of a hill, on the site of Old Agadir before it was destroyed by an earthquake. Whilst not much remains of the kasbah, the views of Agadir are amazing. Be wary of locals who want to tag along in order to offer advice and local insight. They’re hard to get rid of, and of course expect payment for their services (that you didn’t ask for). We did manage to get rid of our tag along eventually, and we refused to pay him, but by the end of the holiday, we did find an easier way. When approached by locals trying to sell you something or generally get in the way, do not acknowledge them, at all. They’ll try getting your attention in about three different languages, but if you don’t respond, they’ll assume you can’t understand them, and move on. We spent all week trying to be polite, but it doesn’t work. Once you speak to them, you’ll have a hard time getting away. The remainder of our city tour was quite short, we were taken to a souk where we wandered six floors of tat, and managed to escape without purchasing anything, and then it was done. We asked the driver to take us back to the Marina rather than the hotel so we could spend the rest of the day exploring on our own. After having a lovely lunch just outside the Marina, we visited the Valley of Birds. Here we found a strange city park zoo, with attractions including sheep and goats, and ‘exotic’ birds (there were lots of pigeons and chickens). Desperate to pee, I also had my first experience of going to a toilet consisting of a hole in the ground…..
Next we headed up the main street and stopped for a drink at the English Pub. It had to be done, and strangely, it was really authentic! We spent the rest of the afternoon partaking in a spot of geocaching. 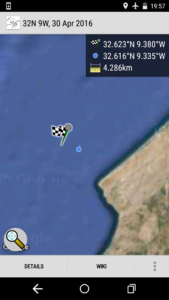 Geocaching in Morocco is much different to geocaching in the UK. Over here we tend to hide caches in places of interest, parks and other local attractions. In Morocco they hide caches opposite guard towers for the King of Morocco’s Palace, down filthy alleys with poo smeared walls, and close to guard huts on the border of the King’s private beach. Let’s just say it made for an interesting afternoon. The first cache we tried was in the trees opposite the King’s Palace. Despite the guard tower we did see a few people wandering the area, so we jumped the wall and went for a look, but we were unable to find the cache. Moving on, another cache was located on the way to the beach front, where more had been placed. Unfortunately it turned out that the location was down an alley, with tons of rubbish and filth lining the path, poo smeared on the walls and god knows what else. Suffice to say we didn’t do much looking and just headed down to the beach. Geocaches on the front were much better, and we successfully located two, well hidden and great to find. You just have to avoid the police and army patrolling the front while you search, so not to look too suspicious. The last geocache on the front was located further down the beach. Arran was tired, so I did this one alone. The cache turned out to be much further down than I originally thought, and I forgot how hard it could be walking over sand dunes. When I thought I had reached the location, I ran up a small embankment and started searching. After not being able to find anything I though I would try further down. At this point I was greeted by a ‘Bonjour!’. I turned around to see a guard hut set back from the embankment, and originally hidden from view. The two guards inside were pleasant, but made it pretty clear I shouldn’t be there, so I turned back around. Now being watched by the guards, I gave up on the last cache and made my way back. It turns out that the cache had been hidden right by the King’s private beach, which probably isn’t a good place to have tourists searching through rocks in the sand. 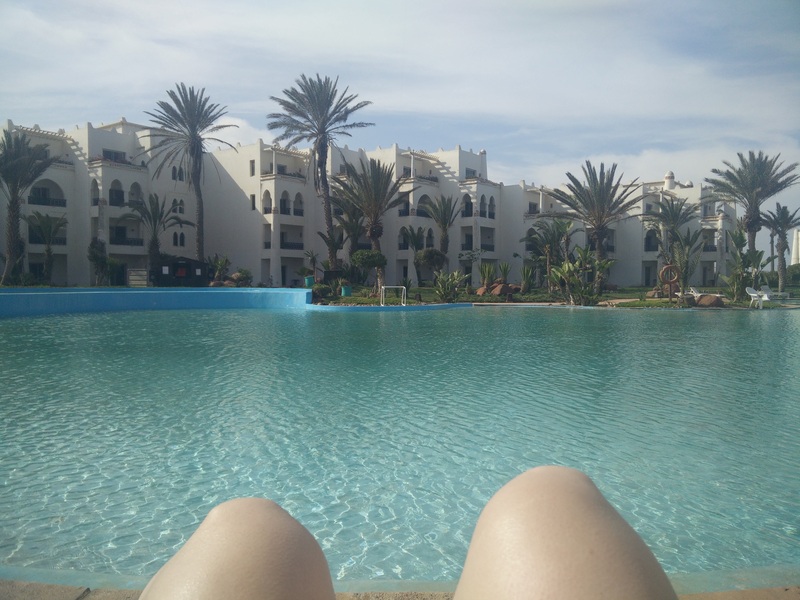 After our exploration of Agadir we decided to spend some time by the hotel pool. Practically having the place to ourselves it was lovely to have a bit of a swim and lie in the sun for a few hours. Pools in Morocco aren’t heated, so it was still a bit of a shock when we fist got in, but really nice once you’ve done it. 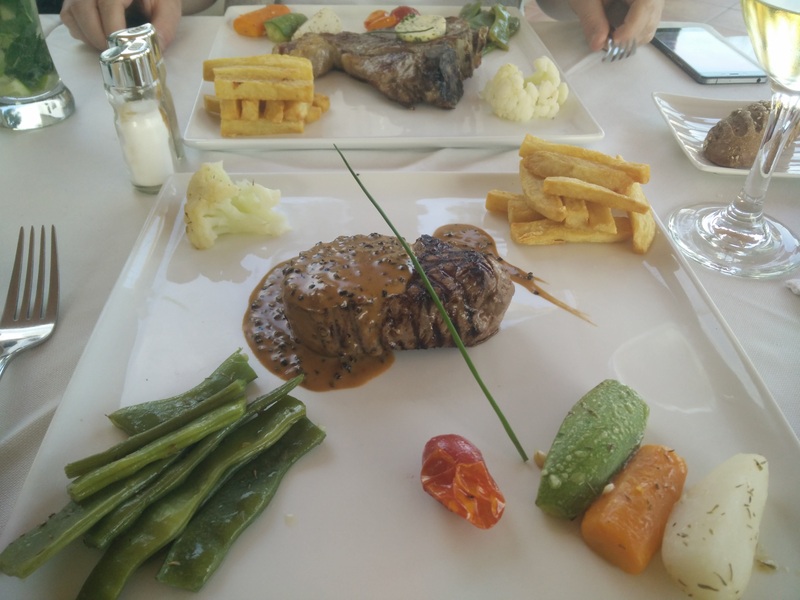 We also went for dinner at the restaurant at the end of the hotel on the beach, and it was much better value for money! It was on our second afternoon that I realised why the concierge was so confused when I told him we couldn’t attend the Berber night on the Friday. Turns out I got my days mixed up, and while I thought we were flying back the next day, we were actually leaving the day after, meaning we had nothing to do for one full day. We spoke to the concierge who managed to book us onto a day trip out on a boat, and I think that this turned out to be my favourite day. Our captain was called Brahim, and he spoke wonderful English, which was great as everyone else on the boat was French, or spoke French. He made us feel really welcome, and I enjoyed the journey out to sea. Once out in the ocean, we dropped anchor and went fishing! I was really rubbish, but everyone one the boat got involved and we all cheered each other when we caught anything. Arran caught two, but I was still struggling. With much help from Brahim, I got my first catch, but I’m pretty sure he did most of the work. Not deterred I carried on trying, and honestly just enjoyed sitting on the boat, in the sun, throwing in my line and giving it a go. I did feed half the ocean, my bait didn’t seem to last very long, but never did I catch the fish who stole it. Finally I got one, all by myself! I was very pleased with my catch, and retired to the front of the boat to relax in the sun. Whilst I caught the sun, the crew set about preparing the fish we had caught for lunch, and a little while later we stopped for fish and salad. I’ve never been a fan of fish, but considering I had caught my own lunch, I thought it only fitting that I tried to eat it. Surprisingly I really enjoyed it, I think that there were so many spices on the fish, it hid the traditional fishy taste I don’t normally like. I think that this day really showed me the joy of relaxing. I had an amazing time, loved fishing, and loved the boat. The rest of the day we spent back at the hotel pool swimming, sun bathing, and carrying on our day of relaxation. For our evening meal we headed to a restaurant close to the hotel called Little Norway. This was a more expensive than usual restaurant, and we had some amazing steaks, although surprisingly, still cost less than the meal on our first night. Our final day we spent by the pool, before showering and checking out. We still had some time before going to the airport, so we popped to a cafe on the beach front for one last chicken tagine before we left. Our journey back to the airport was interesting. Firstly, our shared shuttle had other people on it! Despite Agadir not being overrun with tourists, there definitely were other people there, and when we arrived at the airport, the reality that the holiday was over set in. Monarch airlines don’t allow you to check in online unless you book direct with them, but as most people book through an operator, and the flight home was almost full, we had a HUGE queue to collect boarding passes. This, combined with being stuck behind the most obnoxious and overweight British couple for the hour and a half we had to stand there brought our relaxing holiday to an abrupt end. We boarded the plane and thankfully were not seated anywhere near our queue buddies, and journeyed back to Manchester, which has spent the last few days experiencing a combination of snow, hail and rain. Most of the journey home I spent tracking our flight via gps on my phone. With the flight from Agadir to Manchester crossing 11 graticules, I had my fingers crossed that we might cross the geohash for just one of them. Unfortunately, the closest I got was 5k, which, while in a plane is pretty impressive, in terms of geohashing, was way off. I really enjoyed my time in Agadir. Although there were a few things we would do differently if we went again, I don’t regret anything, and overall we had an amazing time!